Yesterday I posted the game with some notes, today (after hours of uploading), I managed to get one of the videos onto YouTube. There’s another version out there too (taken by my friend Ashraf), as well as shorter clips floating around on Facebook. Looking at the video now, it’s interesting to see how expressive Magnus is during the game. It looks to me like he thought things would be simpler early on, but then became increasingly concerned as the game wore on until he was finally able to smile at the very end. One other thing I realized from the bughouse and blitz games (and this was confirmed in between the two by his team), is that Magnus is ultra-competitive and hates losing even a casual game. Apparently, he had lost a casual game against a computer a couple days prior and he was still sore about it at this event. Magnus overheard that little comment to me and shot a glare in our direction. Anyway, this was a pretty memorable game and the dinner wasn’t bad afterwards either! I’ve met Karpov, Kasparov, and Anand (in that order), but of those 3, Anand is the only one who I’ve exchanged even more than just a couple words with, and I’ve never played a game against any of them. Before Magnus then, the closest I came to playing a World Champion was a casual game against David Bronstein in the early 1990s (he was just under 70 years old, while I was about 9). Maybe at some point I’ll post that game, but it got ugly in a hurry. The Max Lange Attack doesn’t cut it against people of that class! Amazingly, it’s been almost 3 weeks since World Champion Magnus Carlsen visited the Bay Area. I’ve been meaning to write about meeting and playing some chess with him, but somehow I hadn’t quite found the time until today. I had seen Magnus before (for example in Mainz 2008), but we had never really met or spoken. The occasion this time was a dinner at Joe Lonsdale Jr’s house in Woodside (attended by about 30 people). When we shook hands, he shocked me immediately when he said that he reads this blog on occasion, although he admitted he used to read it more when I was playing regularly! He also told me about how he first heard about me, after a game of mine against GM Wang Yue from China in 2002 showed up in New In Chess. It was a Bb5+ Sicilian where he remembered some nice tactical sequences I used, but also that I didn’t manage to win from a much better position. The game can be found on chessgames here and the sequence he described starts with 15.a5!, the point being that if 16…Re8, then 17.Nab5! will lead to the queen being trapped. After chatting for a bit (and being floored by the fact that the World Champion was telling me about how he heard about me, not the other way around), we played a game of bughouse, but not against each other. We were partnered with players around 1500 or so, and while both of us were winning our games, I dominated my side a couple minutes sooner and so we beat Magnus and his partner. The only drama for me was when they would give up the ghost. 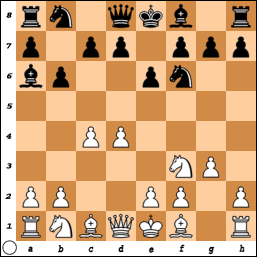 Depending on the opponent, I’ve switched between 3.Nc3 allowing a Nimzo and 3.Nf3. And against the Queen’s Indian, I’ve played a bunch of moves in this position, but it’s been at least 1.5 years since I last looked at anything here. So naturally, instead of any one of the moves I’ve played before (5.Qa4, 5.Qb3, and 5.Qc2), I decided to play 5.b3.